Calum Kerr has done an a-may-zing job of creating, curating and directing the first ever National Flash Fiction Day. There are events and doings all over the country, see here for further details. FlashFlood is a journal to celebrate the day with, erm, a flash of flood. You can read a daft little story of mine there – The Key – which combines two of my passions – book selling and Buffy. There are heaps of fab fictions from flashers all over the world appearing throughout the day, so, lots to read. 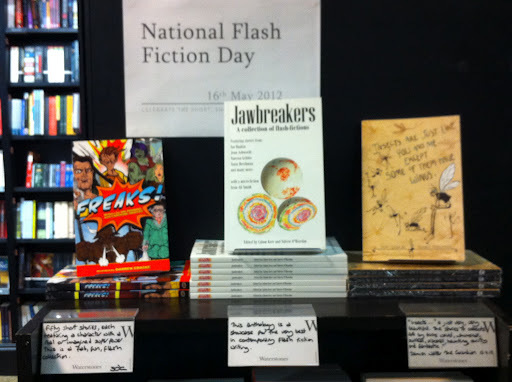 I am really thrilled to be in Jawbreakers which is the official National Flash Fiction Day Anthology. Isn’t it gorgeous? There’s a full list of contributors (including Ali Smith – squee) and details of how to order here, it’s available to download for the kindle, or as a delicious real book. You can also buy it from Brighton Waterstones (which is where I took the photo). Aces! Tonight I’ll be reading, chatting and generally being flashy (harhar) at Southampton City Library. 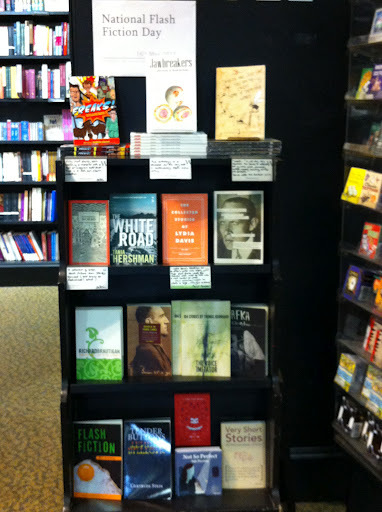 Great post, Sara – lovely to see the book in a real shop display! Yippee!